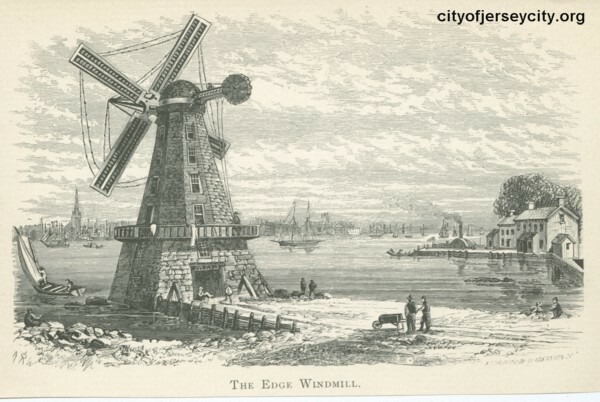 A quaint and interesting landmark of lower Jersey City, for some thirty years, was the windmill near the corner of Montgomery and Green streets; to be exact, it stood upon a pier one hundred feet in length, seventy-five feet north of Montgomery street, and fifty feet east of Green street. According to the family traditions this mill, an exact duplicate of one owned by himself in Derbyshire, England, was sent by Mr. Edge, Sr., to his son Mr. Isaac Edge, soon after he settled in Jersey City in 1806, in appreciation of his success in the New World. Every part was marked to insure its proper erection. The motive power was a windmill upon an octagonal stone tower seven stories in height. The fans on the wings were originally of canvas, but these were destroyed by a September gale in 1821, when Mr. Edge replaced them with iron fans. It was quite a celebrated mill and considered the best in America. It faithfully ground its grists until taken down in 1839 to make room for the New Jersey Railroad tracks. But its days of usefulness were not over; it was removed to Town Harbor, L.I. From there it was taken to Southold, L.I., where it continued to do good work until destroyed by fire on June 25th, 1870. The family still have in their possession the ledger of the old mill and some of the entries are very interesting. The accounts were kept in English currency until 1816. In 1812 flour was sold at the mill for eighteen dollars per barrel. Abraham Reynolds paid one pound, sixteen shillings to have forty-five bushels of wheat ground and three shillings and six pence for its ferriage across the river. The freight on three barrels of flour sent to Sandy Hook was four pounds, four shillings, three pence. James Parker received for his labor only five shillings a day, while Jabez Spinning received thirteen shillings. Mr. Edge lived at the corner of Green and York streets on the waterfront.